Innokin Slipstream Tank is a sub-ohm atomizer for you that whatever you are a beginner or expert vapor, it provides you with amazing cloud and excellent flavor. This tank has a 2ml e-juice capacity, it can delivery you rich flavor. Innokin Slipstream Tank is a sub-ohm atomizer for you that whatever you are a beginner or expert vapor, it provides you with amazing cloud and excellent flavor. This tank has a 2ml e-juice capacity and 22mm in diameter, featuring with compact size design, top airflow and child-proof top cap. Made with premium 304-grade stainless steel, designed to perfection, the SlipStream is a truly well-made device. 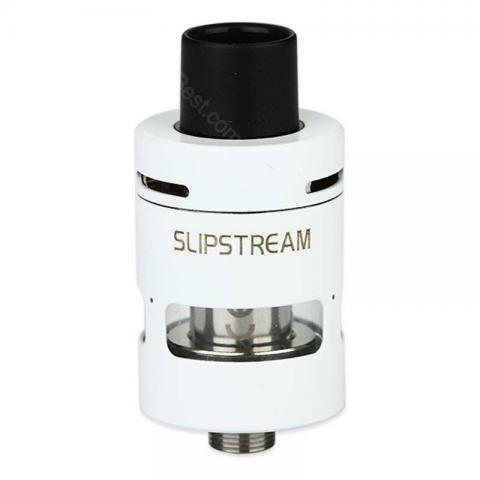 The drip tip of Slipstream tank is made of Delrin for heat dissipation and resistance, that will help to protect your lips even when you use it at elevated wattages. The Innokin SlipStream Tank can work with slightly lower VG e-liquids delivered you rich flavor. • Compatible with Innokin Cool Fire Pebble VW MOD. Received in good condition in about 3 weeks. The tank is as described. Works well on my g-priv baby mod. Easy top filling and coil replacement. Flavor is good. The draw is a bit looser than a Nautilus 2. But still a very good MTL tank. Innokin SlipStream Atomizer Tank - 2ml is very good product. I’m happy with this purchase. Thanks for the quick delivery. Hatte ich vorher schön andere e-Zigaretten probiert, so gefällt mir bei Innokin SlipStream insbesondere der angenehme Flavour und das Rauchvolumen.